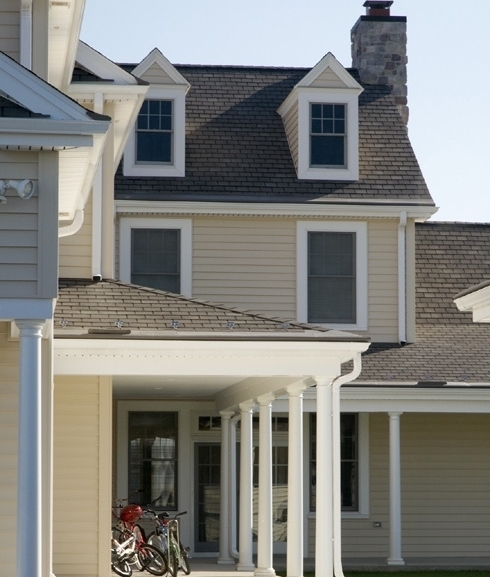 Situated among rolling hills, the Milton Hershey School's Middle Division housing is designed to blend with the surrounding single-family neighborhoods. The school's live-in students follow a regimented program, and its housing had to perform, too. LFA headed up a LEED-compliant design-build project with an aggressive schedule, breaking ground three months after design development began. Following LEED guidelines, 75% of the construction waste was reused, 20% of the materials were regional, and 10 percent contained recycled content. We also preserved open space, protected existing habitat, and implemented an Indoor Air Quality management plan during construction and before occupancy. The result is student housing that conforms to the highest standards of environmental design, while maintaining the character of its larger context. Photographs by Lenny Casper Photography.